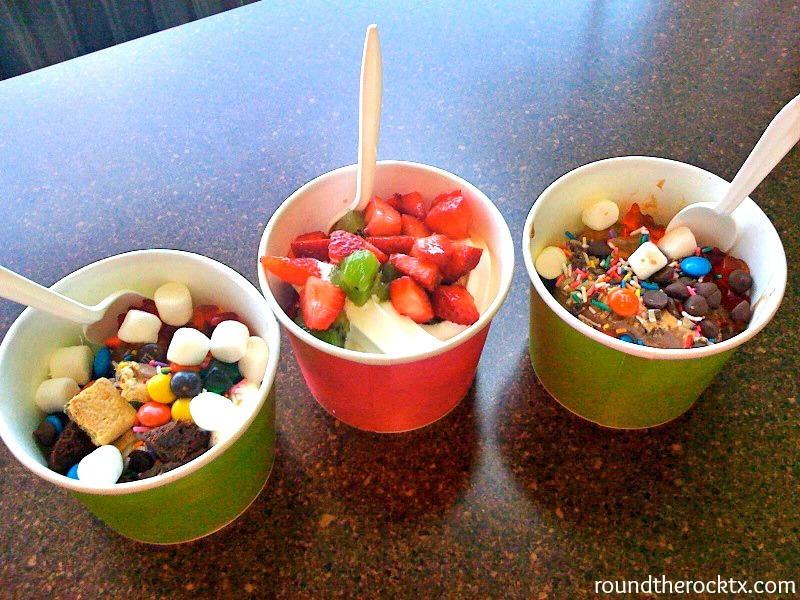 Now that temperatures are heating up here in Round Rock, cool treats are calling my name. There are lots of great places to choose for desserts, but one of my family’s favorites is The Yogurt Experience. The build-your own yogurts please everyone in my family and I personally love the customer service. The owners recognize you – it’s that small business loyalty that I find so endearing and makes me want to return. 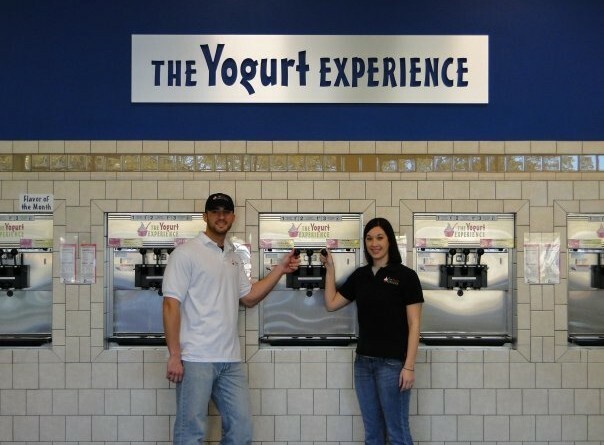 The Yogurt Experience is owned by a super-duo brother & sister team, Steven & Jennifer Broschofsky. Both moved to the Austin area from New Orleans separately but came together to create something of their own. 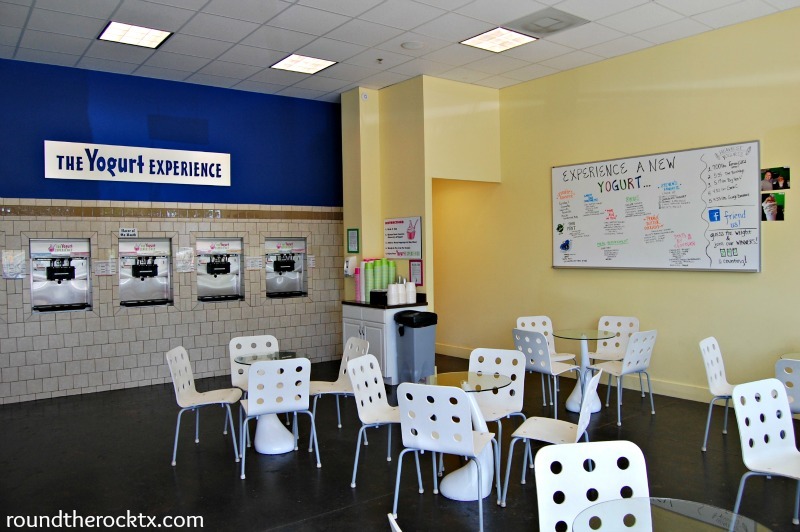 Seeing the opportunity to open a yogurt bar in the north Austin area, The Yogurt Experience opened in Round Rock in 2009. Building their own business from scratch, and not choosing to open a franchise, was hard and they are proud of their work. 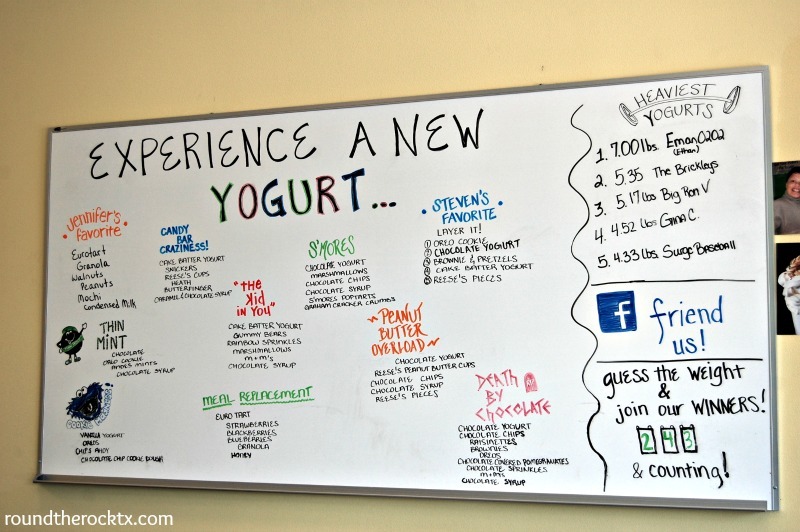 And they should be – The Yogurt Experience is fantastic! I met Steven & Jennifer a few years back when they graciously opened their doors for Spirit Nights for our elementary school. Quite frankly, any business that enjoys giving back to our local community has me for life, but what endeared me to them is that years later, they both recognize me when we come in for a treat. Always greeting me with a smile on their faces – offering suggestions to go with their newest flavors. Have you tried making a S’mores yogurt with the toasted marshmallow??? The Broschofskys like to have a little fun too. 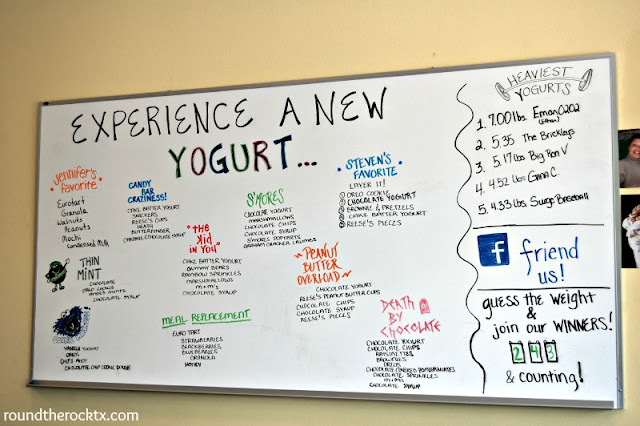 Have you noticed their “Heaviest Yogurt” contest on their wall?? It started in the beginning with 2 guys trying to outdo each other – that was at 2.37 pounds! Now the heaviest weighs in at 7.00 pounds!!! What??? You can also get one for free by guessing the weight of your yogurt. Simply put a quarter in the tip jar and guess before you weigh it. Steven says it is not as hard as you think – over 200 people have earned a free one so far. Try it next time! I also had no idea that The Yogurt Experience makes pies too. This is such a terrific idea for a birthday, anniversary, party or just to have in the freezer to enjoy all week (like we did). 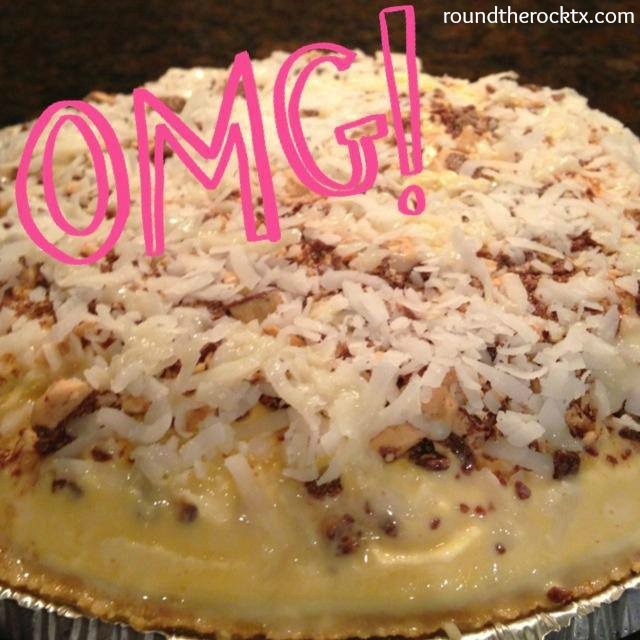 We tried the Candy Bar Craziness: graham cracker crust, caramel layer, cake batter yogurt, stuffed with Butterfinger, cookie dough bites and Reese’s peanut butter cups, another layer of cake batter yogurt, topped with Heath toffee, coconut and a condensed milk drizzle. Y’all – it was amazing. Check out all their different concoctions they can make for you the next time you are in – they are only $13.99 – 19.99! 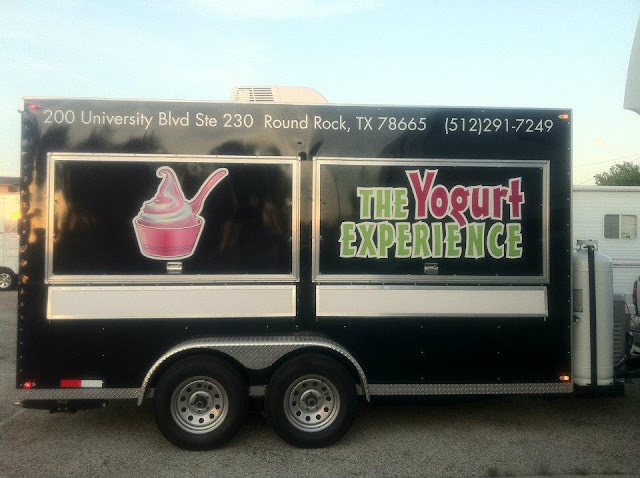 As I mentioned earlier, The Yogurt Experience also supports community organizations, sports teams, and schools here in Round Rock by hosting Spirit Night. They will give back a portion of the sales to that organization. They will also come to your school in their mobile trailer. It carries 4 flavors and is available for carnivals, corporate events, weddings, and school events.